Disney and the MLB come together with these adorable Disney Huggers! 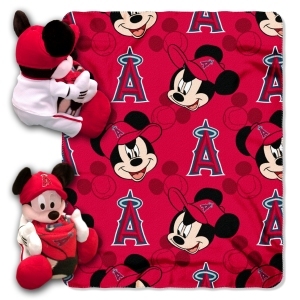 Mickey, dressed in your team’s uniform, comes to you hugging a fleece throw blanket. The blanket has bright, colorful graphics and features your team logo, along with Mickey himself! These blankets are extra warm and have superior durability. They are easy to care for, and are machine washable and dryable. The blanket is 40" x 50" in size.